The forecast heat index for Saturday in D.C. was 109. We actually didn’t get slammed too hard from the heat in the first part of the day because we headed out of the city to Mount Vernon, in Virginia. 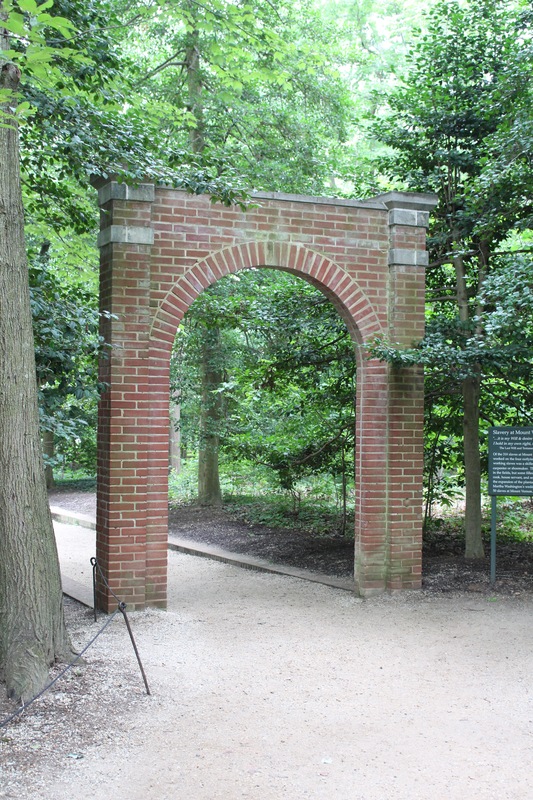 For anyone who doesn’t know, this is the historic location of the home/plantation of the father of the nation, George Washington. It did get pretty darn hot in the latter part of the afternoon, but we coped pretty well with it compared with what we’d encounter on Sunday, about which Angie will be blogging. And, if you’re wondering how we’re suddenly in Washington D.C.: Angie had agreed to work on a project for the American Chemical Society that required a trip to the city. She lived here for a while and is quite fond of the place. I haven’t been here in over a decade, so while she works, I get to take it easy/play tourist. If it stays this hot, it may be more of the former! We came in a couple of days early so we could spend some time with a good friend and get some tourist activities in for Angie too. We arrived on Friday night and were thrilled to be picked up at the airport, rather than having to take the metro into the city. Almost as thrilling, a wonderful dinner solution was presented to us so we wouldn’t have to wait to eat until we got into the district, as the locals apparently call it, since our flight landed after 7. We were also pretty pleased that our bags were among the first off the plane! It turns out that Crystal City, of which I had never heard, is a suburb near to the airport that is home to a branch of Jaleo. This is one of the restaurants created by José Andrés, who is also the creator of Zaytinya, Angie’s favorite restaurant anywhere, which I had yet to try. I had been to the Jaleo in Las Vegas with Angie, so I had a pretty good idea of what was in store for us. We started with the wonderful Pan de cristal con tomate (Toasted slices of crispy bread brushed with fresh tomato), which we had also had in Las Vegas and loved. I can’t remember all we ate, but I really loved the Buñuelos de bacalao (Fried cod and potato fritter with honey alioli), and we all enjoyed the sauteed mushrooms and the marinated chicken. For dessert, Angie and I shared an Espuma crujiente de chocolate con leche (Crunchy chocolate-caramel mousse with coffee-rum ice cream and cocoa nib). It was all pretty sublime. 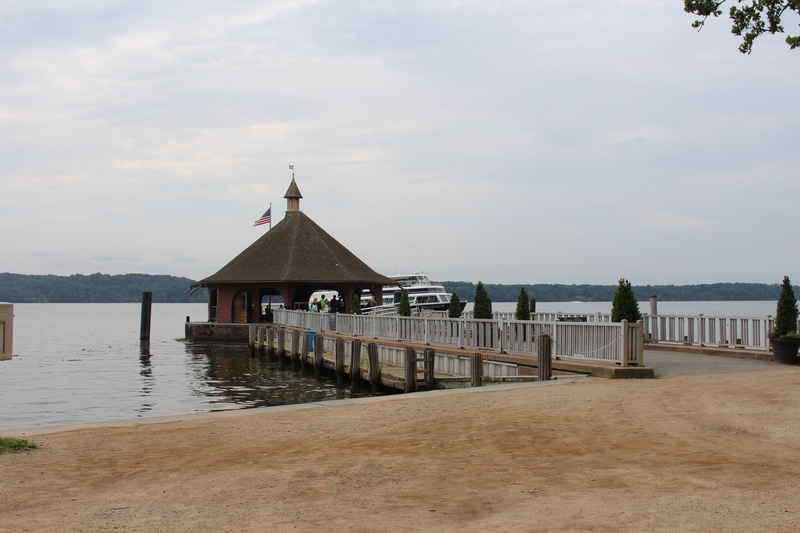 So that brought us to Saturday, and somehow, when we were deciding what to do with our tourist time, Mount Vernon came up. Although there is no shortage of places to see in the city itself, this immediately appealed to me, since I am nearly always interested in anything with a strong historic or cultural resonance. The country’s founding fathers come pretty high in this regard, and everyone else was up for it, so off we headed toward Virginia. I think this also offered the bonus of probably being a bit less hot than the city itself. George Washington acquired this house from his half-brother in 1754 and enlarged it through his lifetime. During the weekend I learned that Mount Vernon was actually the model for the most popular kit home offered by Sears Roebuck, though for some reason, it was called the Jefferson! 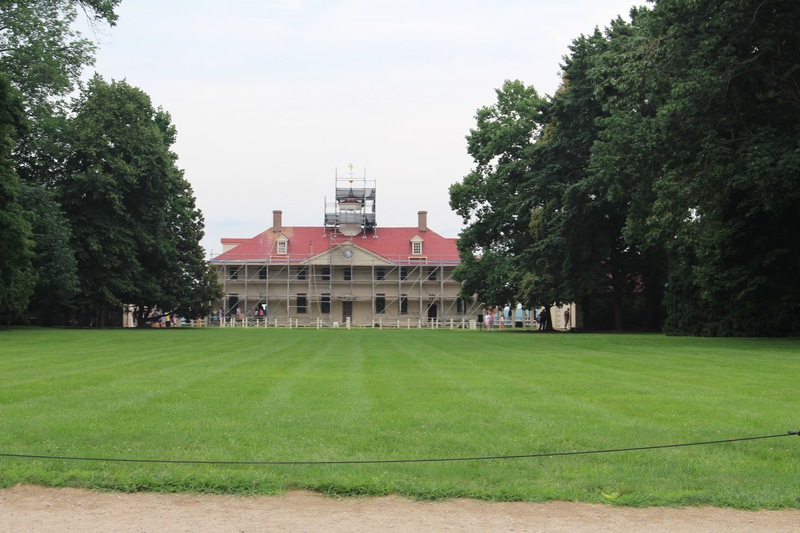 Washington was very focused on both the architecture and the landscaping himself, and this is reflected in the way he set up the approach to the house, although our first impression was marred by the scaffolding that is in place while the roof shingles are being replaced and repainted. 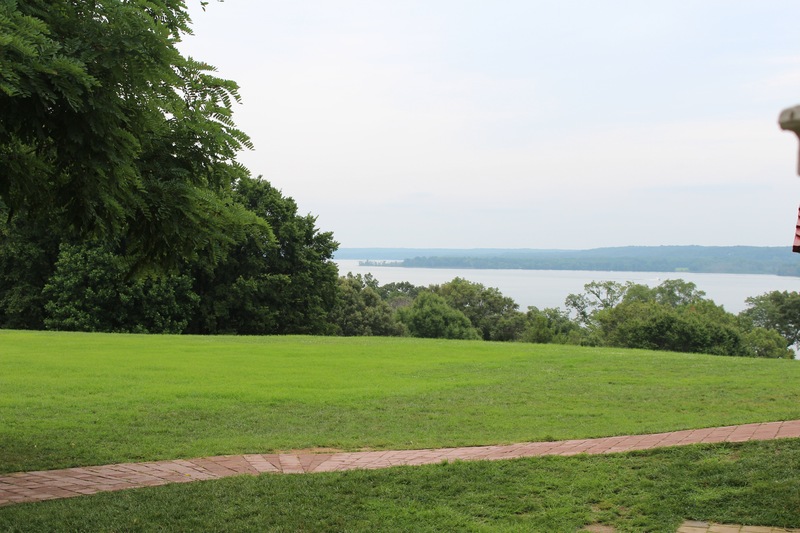 It’s also interesting to note that the view of the Potomac from the other side of the house is also relatively unspoiled because of campaigns to protect the opposite shoreline, which is now Piscataway National Park. The property didn’t seem too crowded when we arrived, but it proved to be busy enough that there is a pretty efficient system for funneling everyone through the main attraction, which is the house itself. There is a docent every few feet and in every major room of the house, and they all seem to have a set spiel so that you can learn some little nugget about the place, whether it’s design features of The New Room (the last room Washington added to the house, designed as a ballroom or grand dining room to match his stature and his desire to project that status as a leading citizen) or the method used to create the faux stone facade. Since he was a pretty great statesman, I give him a pass on his self promotion, and have to also acknowledge that all major landowners of the time also had significant slave holdings. We followed the serpentine route through the main house, and then investigated some of the grounds and work buildings. We walked down to the waterside and then back up past several of the garden areas, where the management of the estate is doing a fair amount to promote the historic farming techniques (with workers in period dress too, though one wonders how much of this work was being done by slaves in Washington’s day). Many of the animals on the plantation are also heritage breeds. We also paid our respects at the slave memorial, which is thought to be the location of at least some of the graves of slaves held here, and at Washington’s tomb. Washington died pretty suddenly, so he was interred elsewhere for a while while his tomb was being built in the manner specified in his will. We were all a little taken aback by the orderliness with which people paid their respects at the tomb, lining themselves up to take turns before it, rather than everyone crowding around it like people do at a work of art (the Mona Lisa comes immediately to mind here). Of course by this point we were all a little hungry, so with a little trepidation, we decided to investigate the restaurant at the Mount Vernon Inn, which is the only nearby choice other than a food court that looked like something in a mall. We reviewed the menu and we all agreed that not only did it look interesting, but was also relatively reasonably priced. Although the salads looked appealing, I immediately glommed on to the lamb sandwich, which was very tasty, and Angie had a goat cheese salad and the house specialty of peanut chestnut soup, which I think was considered a traditional Mount Vernon dish. Everyone declared their choices a success. 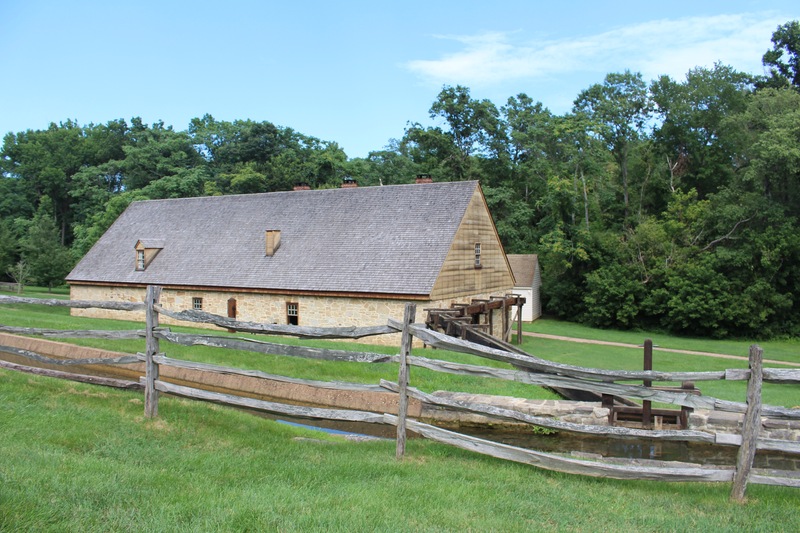 Bellies filled, we set off for the second part of our adventure, to check out the grist mill and distillery on one of Washington’s other Mount Vernon properties, Dogue Farm. 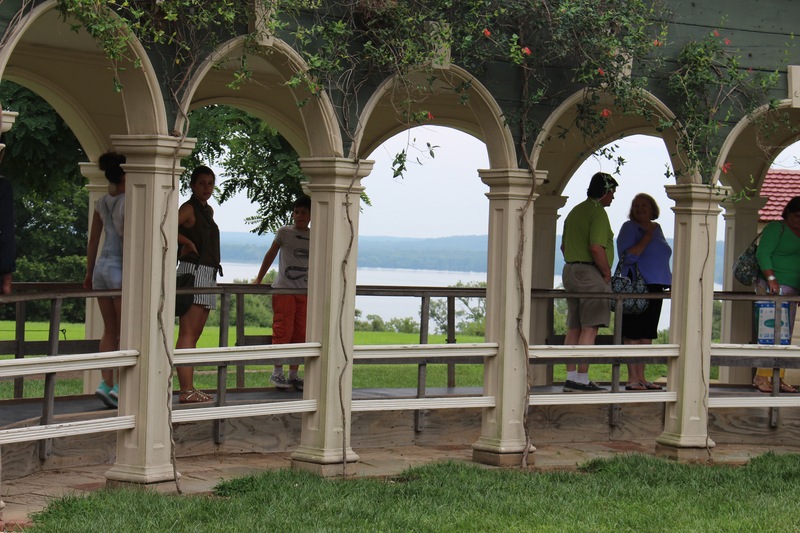 We learned that Mount Vernon is kind of a collective name for a plantation that included five farms, one of which was Dogue, which was the name of the local Indian tribe. 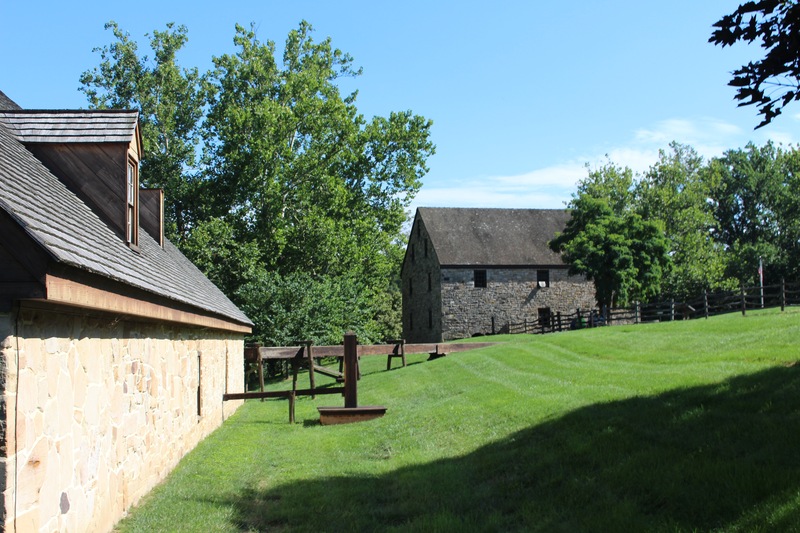 The tour of the mill and distillery is given by folks in period dress and both units are using the production methods used in Washington’s time. So, like many places around the U.S., tobacco was a key cash crop for a time, but to say the least, it plays havoc with the ecosystem, ruining the chemical balance of the earth, so Washington switched a lot of his fields to wheat and some corn. Which meant he needed to figure out what to do with it. First step, turn it into flour and meal, which is more profitable than selling the harvested grains. But Washington’s farm manager was Scottish, and he had another idea that would increase the return on the crop even more: whiskey. Washington was leery, fearful of drunken mobs breaking into the distillery and so on, but his manager reassured him enough that he went for the idea. 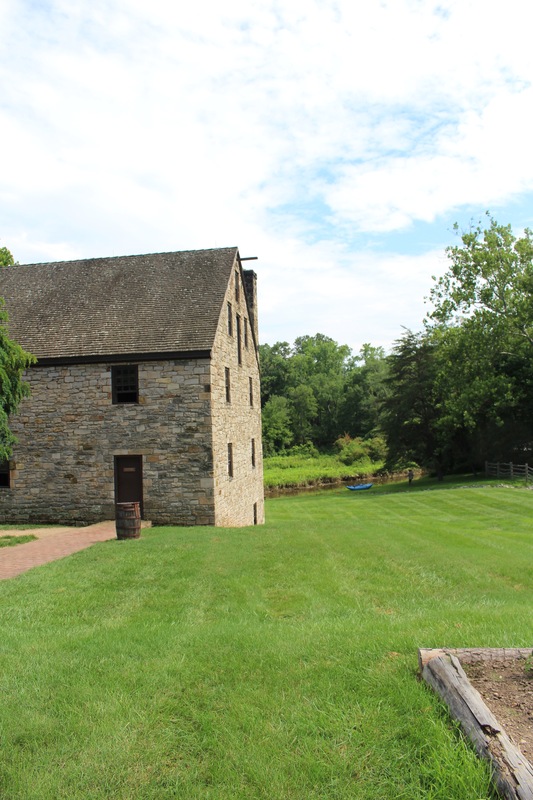 It turned out to be a highly profitable enterprise for the farm, and the revived distillery (which uses the old-fashioned methods for making the booze) appears to be the same today for the venerable Mount Vernon Ladies Association. The whiskey they are making at the revived distillery sells for $98 to about $200 a bottle, and it’s not even as much as a fifth of whiskey, but maybe a pint, and the most aged they have/sell is only two years. 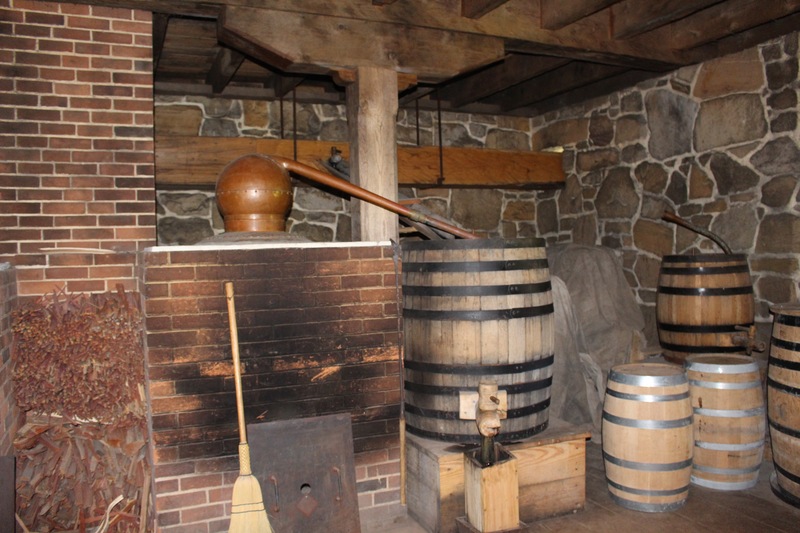 Interestingly, when the mill was first rediscovered, the ladies association covered up the distillery part, but once it was decided to rebuild it, they were actually able to locate it exactly in the same place, even down to the position of the original stills. 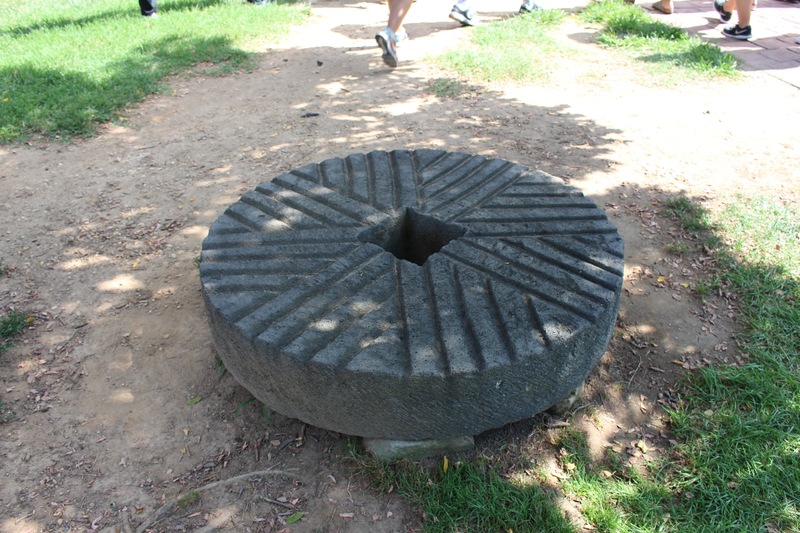 We really enjoyed the descriptions and demonstrations, and were especially impressed with the man who described the distillation process, though we all wondered why on earth people demonstrating the use of traditional stones mills would be wearing ties! It had actually become a lot warmer in the course of the day, so we were ready to be done with touristing. We left Mount Vernon and headed to Hyattsville to meet up with some friends of our hostess for dinner. Once again, we had an outstanding food experience. We met the friends at one of their favorite places in what I understand is a revitalized downtown area. Spice 6 is a modern take on Indian food that is set up in the style of Chipotle, where you work your way down a production line of sorts to build your meal. When Angie and I saw the size of the naan wrap being built for the person ahead of us, we quickly decided to share one, and it was plenty of food. We both enjoyed it very much, and really didn’t need the extra order of garlic naan we’d ordered to go with it. But we ate it anyway! It was a great day both for food and sightseeing and we fell asleep very happy ladies. Posted in Food, USA, Washington D.C.